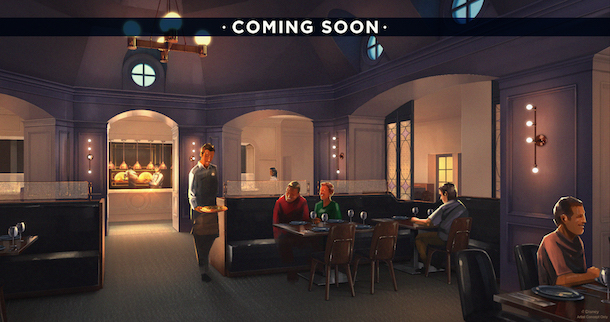 Disney’s Yacht Club Resort will be home to a new restaurant and lounge this fall. The Captain’s Grille is currently closed for refurbishment at the hotel and when it reopens this fall it’ll be completely re-themed as the Ale & Compass Restaurant. The new restaurant will be serving “New England-style comfort food” for breakfast, lunch, and dinner. The hotel’s Ale & Compass Lounge (located in the lobby) is also being transformed with a brand new interior look and 58 seats. This overhaul of the lounge and the Captain’s Grille is part of the Ale & Compass themeing that is happening at the hotel. Earlier this spring The Market at Ale & Compass opened, offering guests a grab-and-go location at Yacht Club. The new Ale & Compass Lounge and the Ale & Compass Restaurant are slated to open in October at Yacht Club.